Four months ago, the Freedom Forum journalism foundation issued a late-afternoon press release that nearly begged to be ignored. Under a snoozer of a headline, it announced seemingly routine management promotions at the non-profit foundation and its signature project, a Washington museum about news history called the Newseum. "These changes,'' Chairman and CEO Charles Overby said, "strengthen the entire management team and reflect the good work that has been done to promote our priorities of the Newseum, the First Amendment and diversity in newsrooms." The release barely hinted at the real news. Freedom Forum and the Newseum had undergone a stunning management shakeup that left several high-paying jobs vacant. They included that of its just-departed president, former USA Today Editor Ken Paulson, who got $443,185 in salary, benefits and expenses in 2009. Moreover, the statement didn't disclose that both institutions had fallen into greater financial straits than previously reported. Now, newly released public documents reveal the untold story. Annual spending by Freedom Forum and the museum has skyrocketed, contributing to $224 million in foundation overspending during 2007-2009 alone, further weakening its crucial income-producing endowment. The museum is the culprit. In 2007, a year before unveiling a $450 million expansion that cost nearly twice initial projections, the Newseum's annual operating costs totaled $36 million -- an average of $99,000 a day. In 2009, they soared to $92 million, or $250,000 a day, the documents show. This is a story about what happened to a glittering fortune -- one amassed by generations of Gannett employees, only to be drained from the company's charitable arm, the original Gannett Foundation. It's also about Allen H. Neuharth, who launched Freedom Forum in 1991 after he retired as Gannett's chairman and CEO. The foundation, the company, and his most famous creation -- USA Today -- are the 86-year-old's legacy. Now, in the twilight of his life, crushing economic forces are threatening all three. Freedom Forum tax documents and annual reports reveal extraordinary spending on construction, interest payments, salaries and bonuses. Coupled with bruising stock market declines, the endowment's non-real estate assets plunged to $400 million in 2009 from $900 million in 2000, when the Newseum expansion started. Meanwhile, as museum staff got laid off, top executives received six-figure bonuses in 2008 for completing the museum, even though it opened years later than first forecast. Overby, for one, got a $375,000 cash bonus, bringing his total pay that year to $991,044 in wages, benefits and expenses. Including expenses over the past decade, Freedom Forum has now paid him $7 million. These details emerge in nearly 10,000 pages of IRS reports Freedom Forum and the Newseum filed in 2000-2009. The 2009 report was filed Oct. 29. I obtained copies of the documents under federal open records laws. They're the only comprehensive source of financial information such non-profits are required to make public. To be sure, Freedom Forum and the Newseum may have other financial resources to tap, including potentially millions in outstanding donations, plus a smaller endowment held by the museum itself worth $27 million at the end of 2009. Still, barring an exceptional reversal in fortunes this year and in the immediate years ahead, it's unclear how much longer the two institutions can be sustained. I asked Freedom Forum officials about the financial condition of the foundation and the museum, in e-mails last Wednesday and on Dec. 8. They declined to comment, other than to acknowledge receiving my requests. This isn't the first time Freedom Forum's spending has been in the spotlight. In a 1994 settlement with the New York attorney general's office, it agreed to curtail what the general called runaway construction spending on the foundation's first headquarters. In 2002, when Columbia Journalism Review reported big cutbacks in international programs to finance the Newseum, Overby told writer Russ Baker: "I have found that there are three things that everybody knows how to run. They know how to edit a newspaper, they know how to coach a football team, and they know how to run a foundation." Signs of the museum's stumbling aren't confined to IRS documents. Consider the Elvis Presley exhibit mounted last spring. "Elvis! His groundbreaking, hip-shaking, newsmaking story," was nominally about how the rock 'n' roll singer was portrayed in the news media. 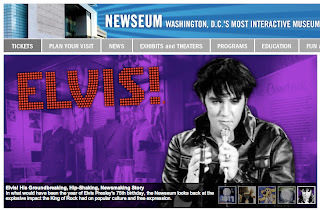 Yet, the Newseum's promotional materials focused more on Presley's personal property from his Graceland home. The museum said those mementos included his white jumpsuit for the 1973 "Aloha from Hawaii" concert, plus a coat and belt he wore to his 1970 White House meeting with President Nixon. The Newseum appeared to be really stretching for ticket sales. The Presley show joined other exhibits built around an expansively eclectic collection of news industry artifacts, owned and borrowed -- and all displayed in the 250,000 square-foot museum. They include 35,000 historic newspapers, a collection of Pulitzer Prize-winning photos, plus pieces of the Berlin Wall, and the electric chair in which convicted Lindbergh baby kidnapper Bruno Hauptmann was executed. Certainly, ticket sales never pay the freight at cultural institutions, especially in Washington, where admission is typically free to better-known places like the Smithsonian Institution. Last year, for example, the Newseum sold just $7 million in often-discounted $20 tickets. That's why contributions and earnings from endowments are so crucial. Freedom Forum started with a $650 million endowment. At the time, 1991, Neuharth had taken control of the original Gannett Foundation after retiring as Gannett's jet-setting CEO. The foundation was established by Founder Frank E. Gannett in 1935 for the benefit of food pantries and other non-profits in communities where the company did business nationwide. Its endowment comprised GCI stock, which Neuharth moved to sell in order to boost the foundation's growth. Gannett agreed to buy it back under pressure, rather than risk its falling to an unfriendly investor. Neuharth soon went on a spending spree that drew the attention of New York's attorney general. In a settlement on Dec. 28, 1994, Neuharth and other governing trustees paid $175,000 in restitution to the foundation for inappropriate spending. Those expenditures included a massage table in Neuharth's office, and the purchase of 2,000 copies of his autobiography, Confessions of an S.O.B., in an "apparent attempt to improve its bestseller standing," according to a settlement summary. By this point, Neuharth had relinquished the Gannett Foundation name, returning it to the company. The reconstituted Gannett Foundation never recovered. It had just $15 million in assets at the end of last year, when its annual spending fell to only $4.1 million. Neuharth's maneuvers would forever deprive scores of communities of hundreds of millions of dollars in charitable support -- from the Rust Belt in Elmira, N.Y., to the farm town of Salinas, Calif., that inspired John Steinbeck's Grapes of Wrath. Neuharth named his new philanthropy Freedom Forum, and gave it a lofty mission: "free press, free speech, and free spirit for all people." His lieutenant for many years in Gannett, Overby, 63, has been CEO from the start; he became chairman of the nine-member board of trustees in 1997. Most of the trustees are close Neuharth friends or associates, including his daughter, Jan Neuharth. Other trustees include PBS correspondent Judy Woodruff. Former Senate Majority Leader Howard Baker is listed as board secretary. At 86, Neuharth himself remains active, the foundation says. As founder, he got paid $216,094 in wages plus $262,235 for expenses last year. The 2009 IRS report says he worked 40 hours a week, but it doesn't detail his duties or expenses. The original Newseum opened in 1997 next to Freedom Forum's first home, across the Potomac River from D.C. in Arlington, Va. Within three years, Overby cited capacity limits in announcing plans to build a bigger home at a location with more foot traffic. In a June 2000 column, Overby said administrators chose D.C. over other sites in New York City and Northern Virginia. The location would be on Pennsylvania Avenue, across from the National Gallery of Art, "positioned between the Capitol and the White House on an avenue famous around the world,'' he said. Eventually, the project would include a Wolfgang Puck restaurant and a residential apartment tower. Overby suggested an opening in 2003 or 2004. "If all goes well," he wrote, "Washington will have a major new tourist attraction in three or four years. And the First Amendment and a free press will have an enduring center that teaches and entertains." Freedom Forum paid a D.C. record $100 million for the Pennsylvania Avenue property; it included an office building that was razed. In that year's 2000 annual report, the foundation said "the entire project, including the land purchase and construction of the Newseum and housing, is expected to cost about $250 million." A year later, in late 2001, then-President Peter Prichard told CJR: "We said originally we thought the whole project would cost $250 million. I think it will probably cost somewhat more than that, but we don't know yet. We're actually in the process of trying to figure all that out now." By 2002, the price tag had grown to $400 million, and the completion date had been pushed back to late 2006, that year's annual report said. It eventually opened in April 2008 at a cost Freedom Forum now puts at $450 million. The trustees had confronted runaway construction before, in their 1994 battle with New York's attorney general, Oliver Koppell. In the settlement, Koppell said trustees had "failed to exercise appropriate cost controls" around construction -- in that case, of the foundation's original headquarters in Arlington. In response, they agreed any future construction would be completed "within the budget's limits, and that projected costs are not exceeded without adequate justification." The 2000 report says the foundation had no mortgage debt; instead, it lists $89.9 million in "loan agreements." That year, it paid no interest. By 2007, however, mortgage debt -- presumably tied to the Newseum construction -- had soared to $362 million. Expenses that year included $1.1 million in interest. Then the numbers suddenly started gyrating. In 2008, the year the museum opened, Freedom Forum paid a whopping $20.1 million in interest, only to see that drop to $6.2 million last year. It was the opposite story at the Newseum. It is a legally separate entity from Freedom Forum, so files its own tax reports. By 2007, the museum also carried a mortgage, valued at $35 million. That year, its expenses included a $785,373 interest payment. The 2009 IRS reports for Freedom Forum and the Newseum don't identify the mortgage holders. The cost overruns could be due to a lack of trained museum experience at the top. The foundation hired consultants to plan and develop the Newseum's expansion. Yet, overseeing the project were Freedom Forum and Newseum executives whose prior experience was in Gannett newsrooms. Long-time CEO Overby edited newspapers in Tennessee, Florida and Mississippi, and was on USA Today's management committee. Prichard was USAT's top editor before becoming museum president. So was Paulson. Freedom Forum's Aug. 11 management shakeup got little attention from major news media. The foundation's statement described Paulson's exit from the president's job only in passing. And it didn't mention two other executive departures. The Newseum's executive director since its 1997 start, Joe Urschel, has stepped down from his $276,000 post. And a former Neuharth chief of staff, Senior Vice President Chris Wells, has left her $291,000 job. Like Paulson's, those two positions haven't been filled. Paulson was named chief executive of the First Amendment Center, a foundation project in Nashville, Tenn. He had been in line to succeed Overby. It appears Overby is now running both Freedom Forum and the Newseum with other deputy directors who survived the shakeup. Also last year, Freedom Forum eliminated virtually all donations to non-profits that have been especially dear to Neuharth, and to Overby and the foundation's other trustees. In recent years, many of those headline-generators went to causes with little or no connection to journalism. They included more than $70,000 to a Cocoa Beach, Fla., adoption agency controlled by Neuharth's third wife. Last year, her Home At Last agency got zilch. Also cut out: gifts to the United States Equestrian Team; Neuharth's daughter, Jan, is an equestrian enthusiast in Middleburg, Va., an hour west of Gannett's corporate headquarters. The foundation's money managers, led by Goldman Sachs, got paid $2.2 million in fees last year. Freedom Forum's income from outside donors and other sources also appears tepid. The foundation itself doesn't solicit contributions from the public. But the Newseum does. It got $5.4 million in gifts in 2009 beyond the $52.4 million from Freedom Forum. It took in another $26.4 million from facilities rental, ticket sales and concessions. Combined, that revenue still fell short by about $8 million of its $92 million in operating expenses. To be certain, the museum may have other resources on which to draw. It listed $53 million in grants receivable at the end of 2009, the tax report for that year says. But it doesn't identify the source of that money, including whether any is due from Freedom Forum itself. The museum has 16 "founding partners" who pledged at least $117 million in gifts toward the new building. The biggest, $25 million, came from the John S. and James L. Knight Foundation. Some of these gifts may be coming via installment payments, so could be part of the $53 million. Also, the Newseum has its own endowment, comprising $27 million in publicly traded securities at the end of 2009. The value of those securities was much higher at the beginning of the year: $48 million; the tax report doesn't explain the $21 million value change, however. Even the museum's closest boosters have hardly ponied up. Neuharth has contributed only $60,000 to the Friends of the First Amendment Society, which the museum calls "the premiere giving society for donors who contribute $1,000 or more to the Newseum." Members have donated a little over $1 million since it was established in 2007. Among Freedom Forum and Newseum trustees, only two have given $30,000 -- Bette Bao Lord and Wilbert Norton. Neuharth's daughter, Jan, falls in a category of those giving $10,000 to $19,999. Overby will soon turn 65. With no clear successor after Paulson's departure, it's now reasonable to assume trustees are looking outside Freedom Forum for a new CEO. I asked the foundation if a formal search had begun; that was among my questions it did not answer. Neuharth would almost certainly be involved in any succession planning. He keeps a close eye on another part of his legacy: USA Today. Last July, Neuharth sharply criticized Publisher Dave Hunke over a full-page Jeep ad that wrapped the front page, calling it the worst mistake made in the paper's 28-year history. USAT is now undergoing a reorganization to boost revenue after steep advertising and circulation losses. Neuharth still writes his weekly "Plain Talk" for the paper from his sprawling oceanfront estate in Cocoa Beach, called the Pumpkin Center. He's paid $100,000 a year for the column, under an agreement-for-life with Gannett. At the height of his luxe Corporate rule, Neuharth enjoyed living in the limelight. Now, amid Freedom Forum's missteps, the light has grown harsh -- and perhaps unwelcome. "Most of us have gotten very nosy about everything and everybody,'' he wrote earlier this month. "But many of us fail to realize how nosy others are about us." Related: Download free copies of the 2009 tax reports. Here's Freedom Forum's. And here's the Newseum's. Please post your replies in the comments section, below. To e-mail confidentially, write jimhopkins[at]gmail[dot-com]; see Tipsters Anonymous Policy in the rail, upper right. Fantastic work. The Newseum is a joke, a crummy museum trying to compete--at $20 a head! (not counting discounts!) --in a town full of great FREE museums (hey, it's almost a metaphor for newspapers competing against the Web. It's clearly not drawing any crowds, it's bled staff--and money, apparently--like crazy, and I'll bet it's dead within a year or two. The building will make a nice shopping mall for Pennsylvania Avenue. The Newseum is almost as embarassing an edifice as the ridiculous Gannett Glass Palace HQ out in McLean--you should run a photo gallery of that monstrosity, so that Gannetteers will know where the corporate money has been wasted. Hell, the annual cost of heating and cooling that building's gargantuan lobby alone could probably fund a pretty good newsroom somewhere. Holy Crap! What a stupendous mismanagement of money, lack of oversight and rudderless captaining. Sound familiar, Gannetters? This report by Jim is the reason I pony up a few bucks on a regular basis for his reporting skills. We need to know who's directing this ship and if they have any clue as to how to steer us away from the rocks. Me thinks, reading this, they do not. I refuse to set foot in the Newseum. Not only is the $20-a-head price far out of line with better attractions in DC, but knowing how the bunch running the place has squandered a fortune just strengthens my desire not to put another nickle in the grubby grip of Gannett -- or anything remotely related to the company, Freedom Forum included. Maybe Overby can fill some of the vacant space with non-violent prisoners? That'd be "nickel," of course. I mistype when I'm pissed off. Love ya, 10:26 p.m., even with the typo. I also refuse to set foot in the Newseum, at least not on a paying basis. This wasn't mismanagement, this was theft. No difference between this and what Madoff did. There's no way I'd ever go to the Nauseum, not after the demise of the Gannett Foundation that funded numerous charities and brought considerable good will the company's way. Incredible reporting. You won't find copy like that in any Gannett papers. Great job, Jim. The really sad part of this tale: As a Virginia corporation, the Freedom Forum could probably run a naked Ponzi scheme and not draw attention from Virginia's AG, Kenneth T. Cuccinelli II. He's busy trying to ferret out misdeeds by climate researchers. Good work, Jim. If the Freedom Forum were committed to "free press, free speech," it would have answered your questions. By declining to do so, it spoke volumes about itself. The apple doesn't fall far from the tree. "The Freedom Forum, based in Washington, D.C., is a nonpartisan foundation that champions the First Amendment as a cornerstone of democracy." Again, I'm reminded that the best way to get rich is to run a non-profit. Bravo Jim! Outstanding work. Hopefully, others will pick up on this mess. Again, bravo! See this is what you do best. THis is great journalism. Enough with the silly comments about heartless Gannett. This is the kind of work you should be doing and you should do it for someone that will pay you a whole lot more than the donations you receive. Think about it. You are a really good investigative journalist. It surely is a distinguishing honor to have wrecked both a corporation and its so-called charitable arm within six years. I say lay off more reporters and give our leaders another well-deserved raise. It's the Gannett Way. Due to a shrinking news hole, the above article, while well written and organized, must be trimmed. We can no longer run articles that are more than 10 inches or 1,000 words, whichever comes first. However, if this was a paid obituatary, we'd bump up the point size and charge the customer for all punctuations and spaces between words. Great job, Jim. Based on history, it looks as if Dubow and Martore are in line to finish off the Freedom Forum and Newseum once they're done running GCI into the ground. Had Freedom Forum's original $650 million endowment been managed prudently, it would be worth $1 billion today. That would produce $50 million in spendable annual income, growing at the rate of inflation. It would pay for a 250-employee Washington news bureau, covering Congress and the federal government like no other, and supplementing the now weak bureaus of other media. It would honor Gannett and the First Amendment mire than 1,000 Newseums. Compare what the Freedom Forum is not doing for journalism against the Knight Foundation, which seemingly is single-handedly funding every college j-school school in the country as well as keeping alive the community aspect by donating monies to the cities where the original Knight-Ridder papers were located. We used to call the FF the USA TODAY retirement gravy train -- if you were high enough at the paper, or spent part of your career kissing Al's behind, then you were almost guaranteed a sweet FF gig. This is great digging and reporting, Jim. As a former employee of the Newseum, who knew there were many problems, I have to say that I'm absolutely stunned by the details of your report. I need an extra long shower after sorting through the rubble. Even though I had no input on any decisions of significance, I'm feeling a big dose of guilt by association. While in no way a defense of what's been going on, I'm compelled to say that there are many fine individuals on the job at the place... trying mightily to create a quality experience for visitors. And they aren't the ones getting rich. It is for their sake that I hope for a happy ending. I cannot believe that they are going through this pile of foundation money so fast. They started out with $1 billion, and now have 40 percent left, according to their statements which are subject to interpretation. So what is the long-term plan? To get other foundations to cough up to keep the Newseum going? The statements indicate they are getting 350,000 visitors, which is way over anything I've seen there. The Holocaust Museum gets about 1 million visitors, and has a budget of $52.7 million. Someone should go to jail. This is at least gross incompetence, at worst a Madoff style plundering theft. The federal government spends millions on steroid hearings and let's thus go on a few feet from their front door. Hope you are shopping this to the WaPost Jim! Fabulous reporting! Amusing that a place which fancies itself as a Temple to openness and transparency...declined to comment. "I asked Freedom Forum officials about the financial condition of the foundation and the museum, in e-mails last Wednesday and on Dec. 8. They declined to comment, other than to acknowledge receiving my requests." The top public relations executive for Freedom Forum and the Newseum is Susan Bennett, a former USA Today reporter. Her title in 2009 was vice president, marketing. That year, Freedom Forum paid her $159,409 in salary; $43,737 toward her employee benefit plan (I assume that's a retirement plan), and $16,093 for expenses. That's a total of $219,239. I last spoke to Bennett on April 3, 2008, when, in a telephone call, I asked her a series of questions about Al Neuharth's annual compensation. Bennett told me she would respond the next day. She did not. Indeed, two years and nearly nine months later, she still hasn't answered a single question that I've posed. Last year, the Freedom Forum's Al Neuharth Free Spirit Scholars program for high school students was cut from 2 recipients per state to 1. It offers an expenses-paid trip to Washington for a conference and a $1,000 college scholarship. Outstanding work, Jim! This should absolutely be in WaPo or the Times or the Journal of Philanthropy. To say the actions are criminal don't do them justice...Congrats on a great piece and I wiill keep on reading and donating! Jim, I think you just messed up any chance you had of getting a Freedom Forum grant! Nicely done, Jim. Thank you. I used to work for Overby at Gannett Corporate many years ago. At the time, I wondered how the man could sleep at night. I still wonder. As a journalist back in the Clinton years, I used to go to many a free author's event at the Freedom Forum in Arlington. They put out a great spread--open bars and some great food. Plus an unbeatable view of D.C. I'd like to think I drank much of the FF's now-spent money. The Newseum, both in Arlington and now in DC, just gives me a headache. Too much noise, bells and whistles. The Elvis exhibition was a joke and pretty much supplied by Elvis Presley Enterprises. In terms of journalism, that would be like USA Today letting Matt Damon supply his own pre-fabricated interview for publication. That said, the Katrina exhibit at the Newseum is quite well-done and powerful. Of course they'd go out of business even quicker if all they did were exhibitions of that quality and seriousness. It'll be fascinating to see what's done to keep the Newseum on life-supports. That's a VERY prestigious storefront to have shuttered. Great reporting, Jim. Neuharth apparently couldn't give up his lifestyle of gold-plated flatwear and sculpted lambs (or goats or whatever they were) in his Rosslyn office. Now the millions in profits sweated out of countless Gannett employees are history, too. That's your real legacy, Al -- hope you can live with it. I don't know whether Neuharth ever forgave the world for his childhood circumstances and what they meant for him, his brother, and -- especially -- their mother, Christina. I still think his mother cast a big shadow across Gannett, one that hasn't completely faded away. Yes, this report is a stinging indictment against the management of this not-for-profit organization. But more to the point, it is an ugly blemish, or much worse, on the organization's Board of Trustees. Much like a Board of Directors, the trustees have a fiduciary responsibility to assure the finances of the organization are not plundered. Where the heck were they? Where was the budget/finance committee of the board? Looks like it was non-existent. There was fair warning: the NY AG report uncovered practices that should make any trustee or director call certain practices into question, if not call for decisive action. I sense that much like many corporate boards, the trustees were do-nothings, know-nothings, and a mere rubber stamp for the organization's management. The Board of Trustees of The Freedom Forum is shamed. They are derelict in their basic duty -safeguarding the financial health of the organization. They surely cannot claim ignorance. Being a board member bears certain responsibilities, even if it is a volunteer position, as it is with virtually not-for-profits. But I bet there were some cushy perks for being a trustee or director of this organization, which could be the reason that they looked the other way in the face of clear evidence of wrongdoing. As a former Gannettoid at one of the community newspapers, I always believed the Freedom Forum was a slush fund for Neuharth and well-connected former Gannett cronies. Your report confirms my suspicions of the fiasco that was building the new Newseum. They never needed to leave a perfectly good facility in Arlington that was only a few years old. And to build the new place the FF kissed off a far more essential project of helping to build press freedom in oppressed countries. But I suppose that project didn't allow them to engage in the self-congratulation of putting their names on the new Newseum. The organization clearly needs new, better leadership, but our family has visited the Newseum and thoroughly enjoyed it. I took my son the Newseum last summer. He's 10. It was our first visit there. We liked a lot of what we saw, particularly the collection of historic front pages and an interactive exhibit about ethics. 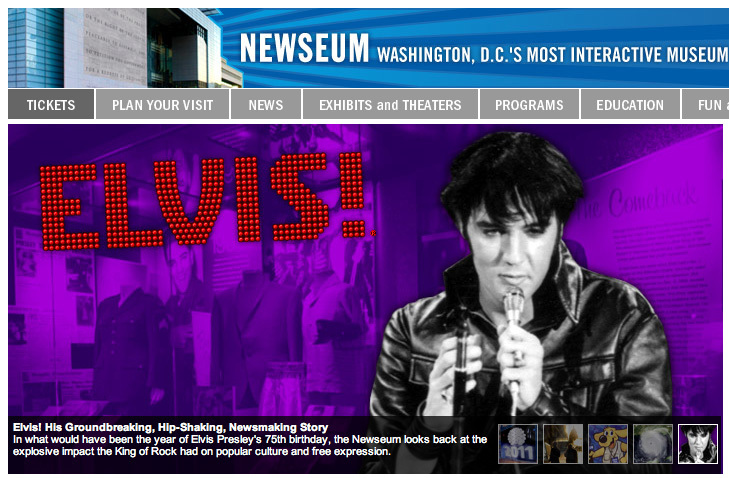 Less impressive were the Elvis exhibit and the one about the FBI. I didn't see how these matched the mission of the museum. The gift shop was full of items related to these two exhibits as well as ugly Newseum sweatshits and T-shirts. The museum also feels a step behind where the media are going. A section on social media and Twitter (with a photo of Rick Sanchez -- is that still there?) were tucked into a corner. For all of that, I'm glad that I went, and my son said it was better than he expected. I hope the Newseum can get its finances under control and stay open. Done well, it would be a worthwhile venture. I've just run across a long-ago reader comment on this post, one that answers an important question about the Newseum's financing. It appears to be investors who bought up to $300 million in revenue bonds from the D.C. government. The D.C. government has agreed to provide up to $300 million in revenue bonds to finance construction of the new Newseum in downtown Washington. The deal, approved July 2 during D.C. City Council’s last pre-recess session, requires the nonprofit Freedom Forum, which operates the Newseum, to repay the bonds over a 35-year period. A Freedom Forum spokesman said the bulk of the bonds will be paid back from the group’s endowment and from revenue generated by the news museum. The group’s endowment, estimated at about $1 billion in July 2000 when plans to move the Newseum from Arlington County, Va., were announced, was valued at $651 million at the end of 2001. A spokesman for the group said that estimate does not include the value of the Newseum’s future D.C. site. The Freedom Forum bought the property at Sixth Street and Pennsylvania Avenue NW from the D.C. government for $100 million, displacing the city’s Department of Employment Services. Of the $100 million, $75 million went directly to the purchase of the site and $25 million went into a fund to finance low-to-moderate-income housing. When completed, the 550,000-square-foot building will include the Newseum, the Freedom Forum’s headquarters and international conference center, restaurant and retail facilities, and approximately 100 housing units. The $250-million project, scheduled to be completed in 2006, is within walking distance of other museums on the National Mall. I once visited the Rosslyn site with a group of students. I would like to take my current students who do our school's televised morning announcements, but nowadays, you have to supply a lesson plan to the school district and tell what curriculum objectives the visit will address. After reading this, wouldn't want to waste our time with it. PS. One thing I remember from the Roslyn site was the newspaper archive that included the National Enquirer or some similar publication's multi-page fold out of Oswald's body in the morgue. As the former editor of two Gannett local dailies, it's very sad to see how the Gannett Foundation got milked so that we can see Elvis' white jump suit at the Newseum. Part of my job was to evaluate the submissions from local charities and civic groups who sought the Gannett Foundation's help. It may not seem like a helluva a lot by today's inflated numbers, but the foundation donated more than $3 million to all our community charities during the 14 years I was involved. It made me proud... but not now, of course. Great reporting. Congratulations on winning the Mirror Award.